Pink and sweet on the outside, power and speed on the inside! 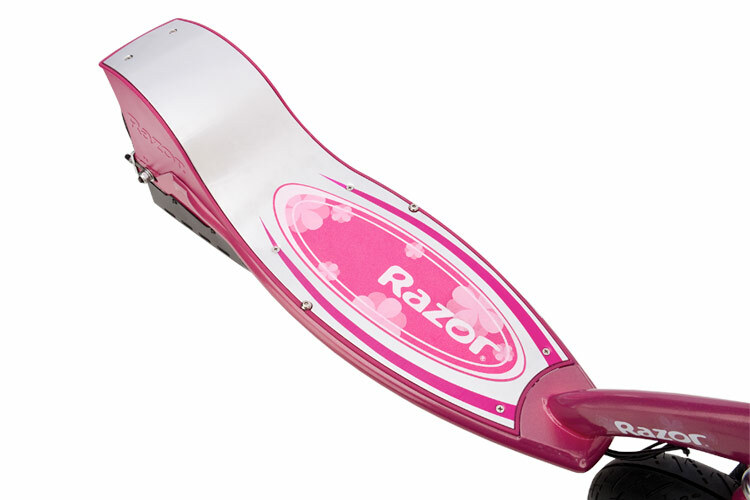 The Razor Sweet Pea E300S Electric Scooter is every girl’s dream. 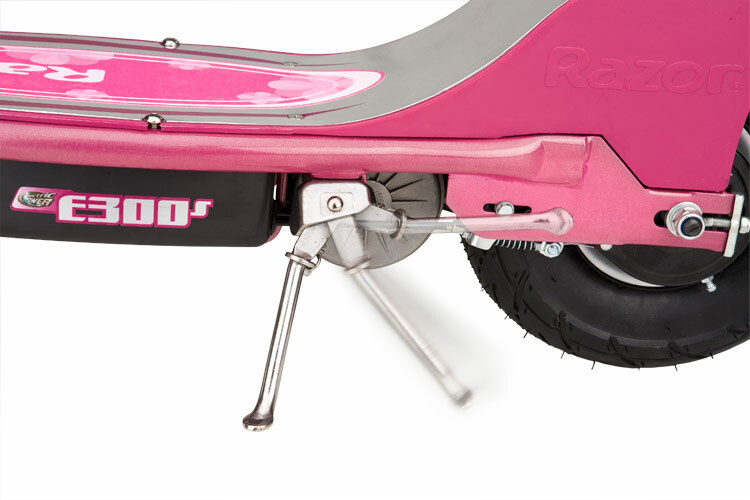 This scooter is utterly feminine, but don’t be fooled, it is packed with power and speed, just like the Razor E200S. The Razor brand has been combining cutting-edge technology, high-quality materials and revolutionary systems since 2000. Quickly becoming an American culture icon for its scooters, it has continued to increase its product line to include Crazy Car Shifts (for drifting), ride-ons, skateboards, hovertracks and jetts (heels with wheels). Today, it offers a full line of products influenced by its Southern California base and rooted in action sports such as BMX, motocross, snowboarding, skateboarding and surfing. The Razor Sweet Pea E300S Electric Scooter offers up to 40 minutes of continuous use at speeds up to 15 mph. 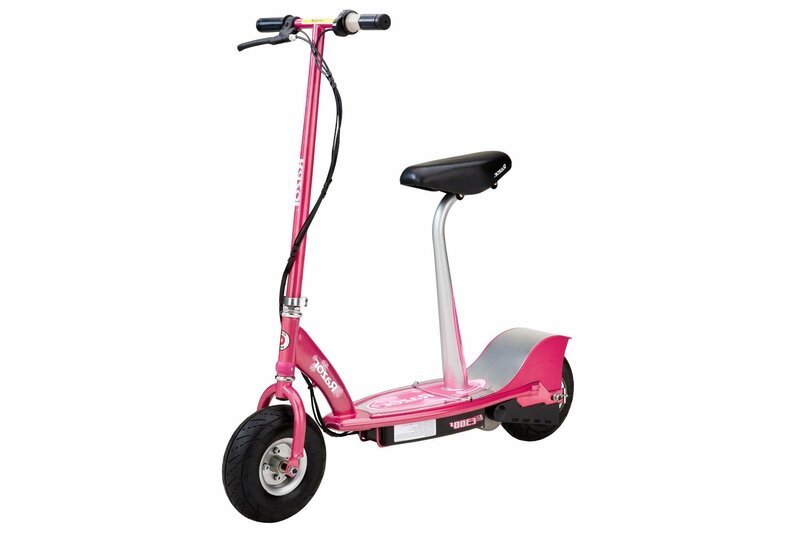 This model features a super-sized deck and steel frame, a high-torque, chain-driven motor, twist-grip acceleration control, a retractable kick stand and hand-operated rear brakes. Pneumatic tires are 10” wide. It operates on two rechargeable 12 volts sealed lead acid batteries. Seat post and seat easily remove for stand up riding. This scooter weighs 52 lbs, measures 41” x 17” x 42 and can easily transport up to 220 lbs. For a tiny scooter, customers say that this model handles the maximum weight (plus a little extra) really well. Young riders may prefer a model with more speed but parents are happy with the 15 mph limit. 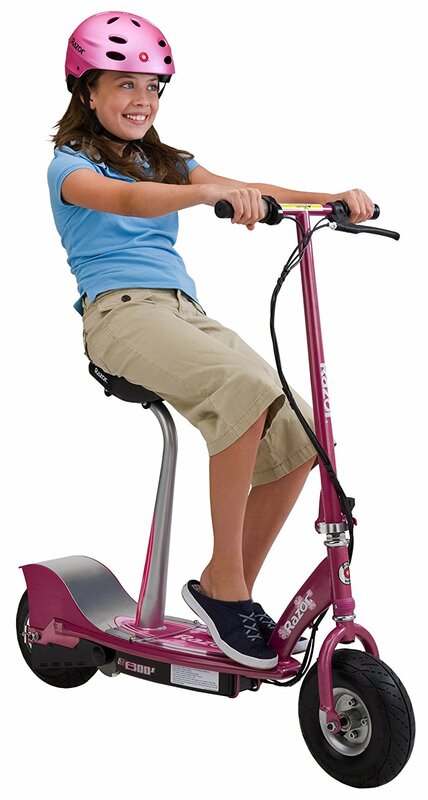 If your child is taller than 5”11, this may not be a model of your choice since the rider will need to crouch. 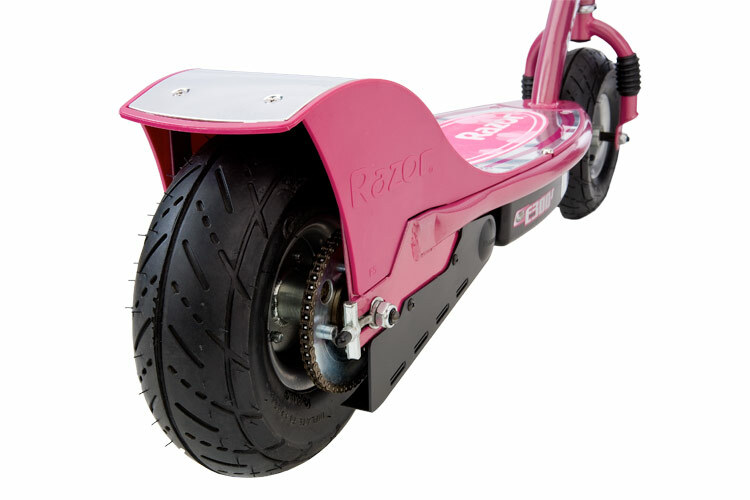 Overall, this is the perfect e-scooter for young adventurous girls. Product Demo: Razor Sweet Pea Collection. 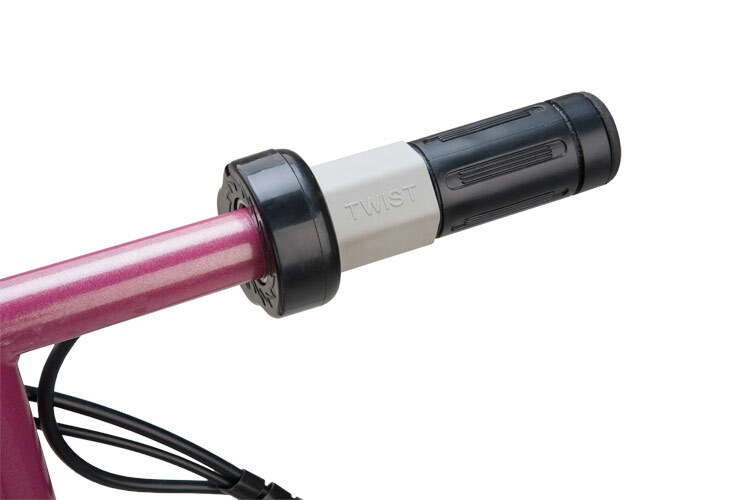 Power and safe acceleration for the thrill-seeking young girl! This e-scooter gives the young rider maximum thrill at just the right speed. 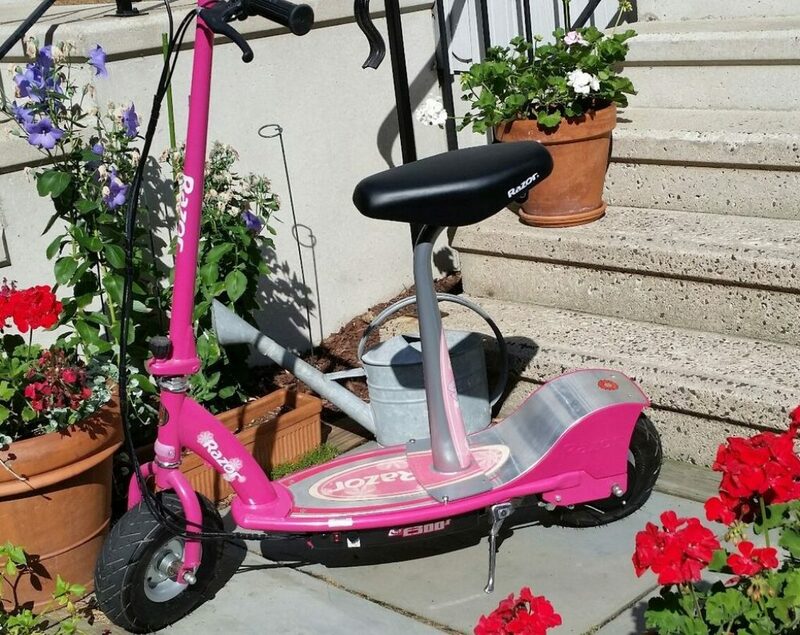 Catchy colors make this scooter the perfect ride for little girls!